“The diverse platforms and capabilities featured in this exercise will enable us to rehearse high-end tactical and integrated warfare scenarios in a realistic training environment both at sea and shore,” Rear Adm. Charlie Williams, commander of Task Force 73, a U.S. Navy task force of the Seventh Fleet which coordinates bilateral exercises for Southeast Asia, said. 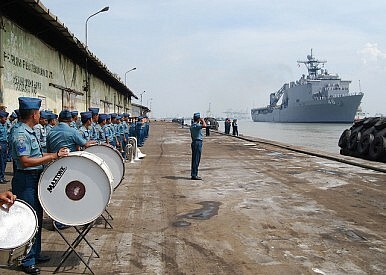 As I have noted previously, CARAT Indonesia is part of a set of annual bilateral exercises that the United States conducts with nine partner navies from South and Southeast Asia focused on maritime security – Bangladesh, Brunei, Cambodia, Indonesia, Malaysia, the Philippines, Singapore, Thailand and Timor-Leste (See: “US Eyes Expanded Military Exercises with ASEAN Navies”). Indonesia has been part of CARAT since the exercise series first began in 1995. The longstanding partnership has led to both enhanced bilateral cooperation between two armed forces as well as an increased complexity in the exercises themselves. “After more than two decades of annual training events between the armed forces, CARAT Indonesia remains a model for cooperation that has evolved in complexity and enables both navies to refine operations and tactics in response to both traditional and non-traditional maritime security challenges,” said Lt. Arlo Abrahamson, U.S. Navy spokesman for Task Force 73. CARAT Indonesia 2015 runs until August 10. Following that, additional bilateral CARAT exercises will occur for the rest of the year with Bangladesh, Brunei, Cambodia, Malaysia and Thailand. Earlier this year, exercises were completed with Singapore and East Timor (See: “US, Singapore Launch Maritime Warfare Exercise” and “US Navy Boosts Defense Ties with East Timor in Maritime Exercise“). Both sides will elevate defense ties and deepen maritime cooperation, sources tell The Diplomat.